This knife is constructed with a 440 stainless steel 10" blade with sharp serrations on the backside of the blade and a rubber handle curved perfectly for a no slip grip. Also, this knife features a stainless steel guard and pommel and an included impact resistant sheath for easy carrying. 15" overall. I've had mine for about a year and a half and it's still great. I use my knives and swords really rough to see if there can take a beating, I'm surprised this one has lasted this long, I got mine off budk for $8. My friend really wants one but I am not willing to part with it. I can't find this knife anywhere for a reasonable price. I OWN ONE . I LOVE THIS ONE . IT FEELS .... NASTY ! I bought 2 of these knives a few weeks ago. AS for it being made in China that's not a big deal at all. In fact when I pulled them out of the boxes they both have close to a razor edge on them. And the serrated edge on the back of the blade is very impressive . The only problems I see with these knives are the sheaths. The belt loop is to big and there isn't a lanyard hole on the bottom to tie it to your leg and every time I would pull the knives out of the sheaths the saw/ serrated edge catches on the sheath. But besides that I would recommend these knife to my friends and family.. Thanks Bud-K. I will be buying more of these. What a piece of junk. Made cheaply in China and you can tell it. Broke the first time I used it with any torque at all. Not worth the trouble. Spend a little more and get a full tang knife. This one is a looser! I bought two of these knives recently, just because of the awesome price tag. Well, I beat the hell out of one in every way I could. If this knife had a $40 price tag, I'd still buy it. Definitely an outstanding buy! I loved that knife. The size, the weight, the shape, everything. There is no reason you should listen to me, but there is no reason for you to spend your money on a poorly made piece of junk. I constantly had to strew in the bottom so that the blade would not fall off! And the blade couldn't hold a edge no matter what I did! There was a reason I did not bring it boar hunting! I dropped it while walking in the woods and it broke when it hit the ground! 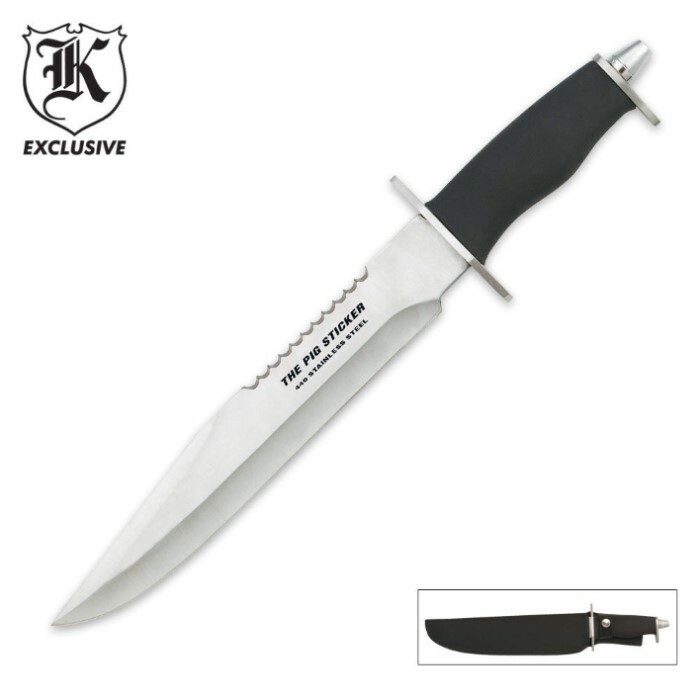 My advice to you is just save up for a K-BAR knife! At least a K-BAR will not break after a three foot drop! I stuck a 250lb boar with it and it lived up to its name. I bought this knife about two years back, and it still works great for what it was designed to do: Look awesome. It is intimidating and cool to mess around with, especially with the price, but I can't say that it is a "workman's bowie". It is not full tang. I took it apart and put some lock-tite on the screw part that is connected to the blade, and then screwed on the nut as firmly as I could. It doesn't rattle or anything like that, but its just not going to have the durability of a full-tang. Overall, it looks awesome and will get minor cutting jobs done, but I am not sure if I would get it if you want a rigid, durable bowie that will take abuse.